Kuroi Tsubasa: The Excellent Internet Access Shrine! The Excellent Internet Access Shrine! "Ore-sama thanks you all for your adoration! I love you too! ^_^ Not quite as much as I love Fin-chan, but..... anyways, a big thanks for the hits! I'm really glad that 'Kamikaze Kaitou Jeanne' is so popular, and that I'm so popular! How cool is that? I wonder if Chiaki has a shrine.... Aren't we studs? All praise to Tanemura Arina-sensei for her awesome character designs! Have a fun night. I'm off to checkmate!" Access Time is an angel who aids Kaitou Sindbad in defeating demons that appear in paintings. If Sindbad pierces a painting with a special pin, the demon will turn into a black chess piece. Access collects the chess pieces. Access is also essential to the mission, because he uses the jewel on his forehead to help Chiaki transform into his kaitou self. Kaitou Jeanne, a reincarnation of Jeanne d'Arc (Joan of Arc), is also collecting chess pieces. They're rivals, but Sindbad falls in love with Jeanne and decides to devote himself to protecting her. Access supports Sindbad, but why he must collect the demons is unknown. Access once lived in heaven with other angels, including Fin Fish, whom he loves deeply. She always rejects him, but he told Chiaki that it is worth all of the hurting, because if someone else gets her it would be worse. He'd be very sad and heartbroken. Once Access grew a magical flower called Saint Lovers which, when a petal is eaten by someone, will make him or her fall in love with you. Fin ate a petal and became crazy about Access. He enjoyed this a lot, but soon decided that this wasn't the Fin he knew and loved. He took back the petal and she returned to normal. Access knew she would no longer care for him, but he was happy that she was free to love whomever she chooses. He doesn't given up hope that she'll return his feelings someday. Hey, Stephanie here. I'm the girl who created this page. There's a lot of manga and anime characters that I really love, most of which happen to be the guys of the series. Pretty much all of them had a webpage except for Access Time. ::insert shocked gasp:: So I had this desire to make him a nice little page for his fans to visit and show their affection. Because I've been so busy with other anime-related web projects, I initially thought that I couldn't do it, but the thought kept coming up in my mind each month I got a new issue of Ribon magazine. Well, as you can see, I decided I'd better do something fun for me once in a while and this was it. Okay, enough with the babbling. Well, the unimportant babbling, that is. What this section is really for is to describe what I like about the darling Access. I'm sure you can think of more reasons, so please fill in an entry in the guestbook. There's a specific spot to write in what YOU love about him. Let's start with his looks. First off, I love his big glassy eyes. They're so cute. Then his hair. It's purple for one thing, and it's long for another. Manga guys can make long hair look so nice, can't they? Access is no exception. He started off his appearance with a low ponytail at his neck, but later has worn some other cool dos like a high ponytail and wearing it down. I can't decide which is my favorite. His bangs are also a noteworthy coolness factor. Okay, so it sounds a bit weird. But imagine if he didn't have bangs. There'd just be something missing! Access sports a stylish shiny purple gemstone on his forehead, and he has elf-like ears. I'm not too big on the ears myself, but they do add to his distinct image. Not to be overlooked, his single pointed tooth gives him a vampire-like bad boy appearance. Personality. Access is energetic and cheerful, which, if you think about it, might be difficult considering all of Finn's rejections of his love. It shows character. I love his devotion to her, and how his face gets SO red when he looks at her smiling or being particularly cute. Access is dedicated to his mission. He'll interrupt Chiaki no matter what he's doing with news of a new demon to checkmate. Access is also sensitive, we can see, when he gave Chiaki advice about not hurting Maron in chapter 16. Obviously, he must know something about dealing with emotions and being truthful. Access has belief in people, and won't give up on those he cares about regardless of what happens. He has the confidence and level head to make a quick decision in a desperate situation. Fashion sense. Access is a good dresser. He has a few different outfits, and each one looks pretty trendy. The colors all coordinate with his hair and wing color. He usually wears combinations of purple, black, yellow, and red. My favorite piece is his shiny purple leather that has a zipper on the front. His choice of a yellow hair ribbon is very hip. Speech. You know Access is one confident angel since he refers to himself as Access-sama. In Japanese, the suffix "-sama" is 1) a polite equivalent form of "-san", 2) used to express appreciation, OR 3) used for gods, royalty, or someone one "worships". It's safe to assume he's got the 2nd or 3rd meaning in mind, since he doesn't talk in an especially polite form of speech. If you've watched the KKJ anime, you've heard his seiyuu (voice actor). Yajima Akiko's voice conveys his lines easily and sounds oh-so-cool. At first I was very surprised at the choice of seiyuu, as I had imagined Access to sound a bit older. Once I got used to it, though, I really like Akiko's work. She gives Access a young, boyish tone that fits well with his cheerful and carefree nature. "Kamikaze Kaitou Jeanne" is a mahou shoujo, or magical girl, manga and anime series. For more information on magical girls, please read the History of Magical Girls article by Dave Endresak in the Guardians of Order Sailor Moon Role-Playing Game and Resource Book. You can order the book from Amazon.com using the link! Tanemura Arina is the very talented mangaka (manga creator) of KKJ. She is especially excellent at romance, drama, and supsense in her work. Her artwork is gorgeous in style, color, and detail. I'd say she can draw really suteki (good-looking / cool) guys, wouldn't you? 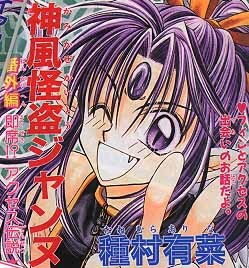 ^_~ KKJ is her third manga series after "I€O€N" and "Kanshaku Dama no Yuuutsu". If you like or are interested in Kamikaze Kaitou Jeanne, make sure to check out these other wonderful series as well. You can find out more about them by looking them up on the Anime Web Turnpike, and I have webpages about 3 of them linked below. More KKJ manga translations, as well as other shoujo manga! Ribon manga translations, as well as other shoujo manga! a club for everyone who loves Nakayosi and Ribon! 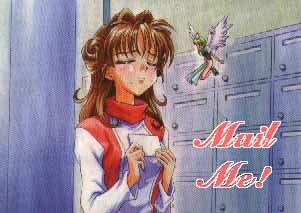 Lots of shoujo manga translations, such as Wedding Peach, Card Captor Sakura, Dream Saga, Kaitou Saint Tail, and more! buy anime and manga here! buy anime and manga merchandise here! A webring is an easy way to find similar sites to the one you're currently visiting. Clicking on "List Sites" will take you to a webpage of links to the other sites that have joined the ring. Please enjoy these, and even join some if you have a website that would be included! This Bishounen Underground Web Ring site is owned by Ami-chan. Want to join the Bishounen Underground Web Ring? This site is owned by Ami-chan. Please give these poor neglected bishonen the attention they deserve! This Pure Manga Ring site is owned by Ami-chan. Images, story, series info, character profiles, links, and more of Cyber Idol Mink, the newest manga from the creator of Kaitou Saint Tail and Dream Saga Takamagahara. This very cool manga is about an ordinary girl named Minku who transforms into an idol star using a magical CD-ROM from the future. A guide to finding the anime and manga series which were created for and targeted at the BSSM fan, easily and affordably! Read the descriptions, look at the pics, and click on a link to order any item from the world's largest bookstore, Amazon.com at discounted prices! The most easy, inexpensive, and secure way to get anime & manga - the way you want it! "Small Lady & Elios: A Match Made in Manga" is a web page completely full of romantic pictures of Princess Small Lady Selenity (a.k.a. Chibiusa) and her love Elios, characters from the Bishoujo Senshi Sailor Moon manga! Plus, some information on their story and names!